Through illness I missed one client session but have been informed by fellow students on the goings on of the project. In session 16 (my absent session) the group held a group critique so that we could evaluate if the new formed pipeline and sub-teams are working more effectively than the process we was following previously. From what ive been told much higher quality work and amount has been produced since the formation of this pipeline. This pleases me greatly as the method of industry practice that we have implemented has worked and collaboratively we are now showing that we can work as a team effeciently. For the rest of that session everybody continued with the work already tasked to them after Phil had introduced to the group the research on PBR (Physical Based Rendering), with a little bit of research we realised that UE4 our engine is a PBR engine, therefore all the texturing we have currently done is not going to be the standard it could be if we did PBR methods. PBR basically deals with light naturally like it is in real life, the most common maps to use are diffuse/albedo and gloss then you can apply normals and so on. Basically with PBR there is no need to adjust brightness/darkness on your textures for different lighting in engine it is one texture that works for all the albedo map has no lighting information on it so its all calculated in engine. It the latest exciting thing in games that is currently being used in next gen games such as RYSE and Dragon Age Inquisiton. A brief glimpse there of the types of maps all used just to make a incredibly realistic leaf. If we want our project to look and feel real we have to really look into this and learn the tips and tricks behind pulling it off for the project. I found this demo reel after a bit of PBR research one night and then showed it to the group, it just proves how amazing the detail can be all in texturing we just need to knuckle down and work it out to maximise the potential of our work. This project using PBR could we a fantastic porfolio piece, so this is now the art teams main focus. Moving on to session 17, I return still not 100% but I dont like being off. The begin the session Phil had been showing me his progress on a portion of the street he was remodelling from semester 1 which he had now included shop interiors, this had been discussed earlier on in the year but never materialised. Now to show what it would look like and how it would be done Phil showed his work to the group and we delivered a group meeting based on interior design for the buildings. We stated this would not be applicable for all the buildings as we may be trying to run before we can walk but certainly for certain shops that we can show off 60s fashion, music and culture this oppurtunity shouldnt be passed up. This means more work for me and my 3D team but it will be beneifical for the project, one of the feedback notes we was given for the project at Hand in is that the shops dont look realistic when looked at because of the shop fronts/ windows by modelling a simple interior (possibly inaccessable) it creates a more naturalistic feel to the project that will further immerse the public in our work. We then proposed to the group to do a section of the project each for my 3d team. By doing this models should all meet up correctly, be to scale, and having multiple buildings produced side by side by yourself will be great for a porfolio piece. The street i chose to take was Silver Street (Right side) this was because i currently have wetherspoons on trinity house land which goes round the corner onto that side of Silver Street so its only logicial to continue with that area. 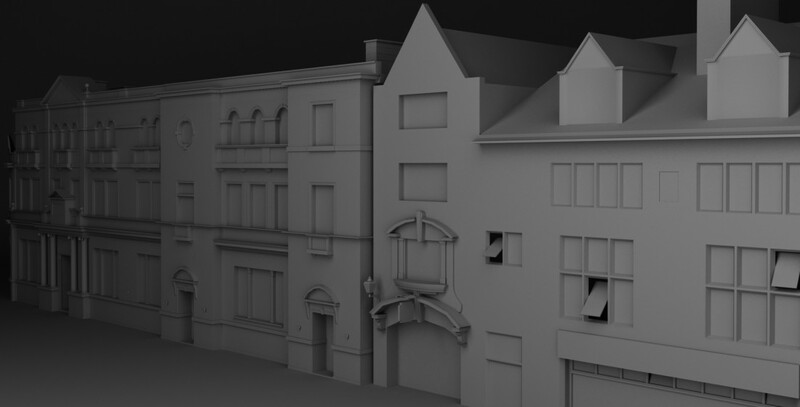 The street section chosen by each person will require them to model interiors (where applicable and approved by myself) and all assets related to that area of the street. For example if my street has a flower shop, that would require me to model flower shop related assets such as a flowers in a vase to go in the shop window. After this i had a little talk with Paul my tutor, he expressed he is pleased with the groups advancement and focus since the return but as team leaders myself, Phil and James need to keep a close eye on who isnt working enough. To tackle this Paul proposed we set weekly tasks to the individuals in our team to complete by the next client session, this will make sure people have a sense of deadlines and produce the work. Now as a leader i have to dicuss with my individuals what they think for them is achievable in that period of time. I explained to each one of them this will be a trial and error thing what do they think they can do in a week and what they actually can do, so one week i may realise that as Viktor has sculpted a statue by friday instead of tuesday is that he has been under tasked so in coming weeks a balance can be formed to how much they can do. Its a test to show that those that might not always be in fifth gear if they complete an amount of work then underachieve in the following weeks they should be working harder as i know they can. Alongside this obviously i have to task myself some work to do. Currently im working on wetherspoons on trinity house lane and my new tasked street is Silver Street’s right hand side. This will be very helpful for the speed of the project, the sooner we get the streets done the more time we have to fine tune and improve every aspect of our work. With 9 weeks left times running out for us but we can do it. Categories: Client Project | Tags: 1960s, 3D, Brief, Client, Design, Design Process, PBR, progress, Project, texture, unreal engine | Permalink.